Welcome to Colorado ICONS, an interview series devoted to giving you an inside look at some of Colorado's most influential figures and legends. This week, we met with Jake Jabs. If you've spent any time over the last 30-plus years watching television in Colorado, then it's highly likely that you've seen American Furniture Warehouse commercials featuring CEO Jake Jabs sitting among various wildlife animals. 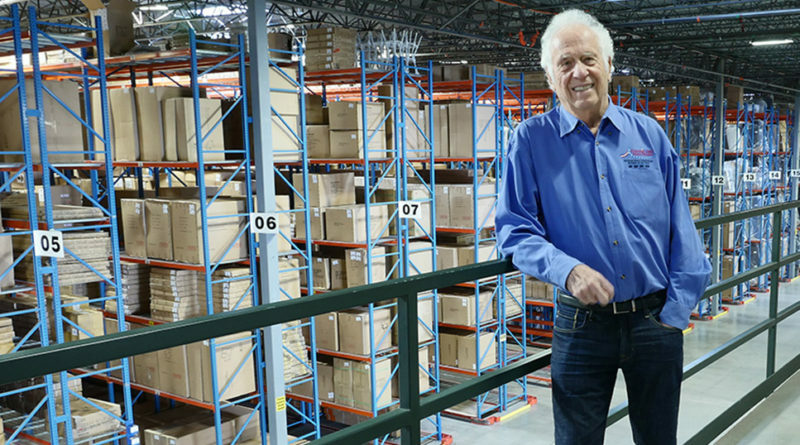 We had the immense opportunity to speak with him about those infamous commercials, as well as get a behind-the-scenes look at the massive warehouse facility. OCN: When I first came to Colorado, I noticed American Furniture Warehouse had all the wild animals in your ads. How did that all start and where is that now? JAKE JABS: My wife and I had three daughters, and we bought our daughters a puppy for Christmas. So they said, "Dad, put the puppy on TV!" And I did, and right away the phone started ringing, and people were offering us their domestic animals. It was after the filming for Lincoln Mercury with the cougars, where he had a bunch of pictures with exotic animals. (Someone) said, "Jake, you should use these exotic animals in your commercials." And I said, "Guys, I don't get exotic animals and furniture!" My second daughter always wanted to pet a baby tiger, and she was privy to this conversation, so she conned him into bringing a tiger down. Her office was right next to mine, and so she had a baby tiger in her office the next morning, and all the employees gathered around. I'm mad nobody's working, but I saw a lot of interest in the exotic animals -- more so than the domestic animals -- so we started using them. It became a trademark with us. I didn't own them; I'd just get them from different people that own them because I like animals -- I grew up on a farm in Montana. I rode horses; I rode for Montana State College's rodeo team. Anyway, I knew animals growing up on a farm, so I got along with them fine. So we used them for years ... I think a lot of times when you're starting out, you need something -- you need a "gimmick" or trademark or something. And they surely became a trademark. So ... that event in Vegas where the tiger almost killed Siegfried or Roy, remember that? So the Federales said, "You can't use exotic animals in public." And so the people who we were getting them from pretty much went out of business. You know, in America, a lot of the times we overreact to one incident, you know? So basically, the animals went away and we're going on our fifth year that we haven't used them. It hasn't hurt our business, our business is still growing, we're still doing good. At the time and place, it was probably the right thing to do. OCN: What's a typical day these days for Jake Jabs? JAKE JABS: I come in the morning, and I'm coming in a little later now. JAKE JABS: No, no, no, closer to 9 a.m. now. I used to come in at 6:00 a.m. But I come in at 9 a.m., and I do that purposely, kinda by then everything is rolling. The trucks are going out and everything. One of the first things I do is, I go through my mail and see what's in there and get that taken care of. Right now, I sign checks; my daughter is on vacation, but normally she signs the checks. Between her and I, we sign all the checks. OCN: There's a lot of checks to sign, I'm sure! JAKE JABS: So, I get all that out of the road, and then what I do is I go to the warehouse. I think one reason we're successful -- we are known nationally as having the best backroom in the furniture business. The backroom is what makes this work out here, and if you don't have good delivery -- delivery drivers, merchandise in stock, and a trucking operation, and all the things we do best -- if that isn't good, then the front end isn't good either. I've always put a lot of emphasis on accurate inventory and the backroom. So every day, I go back there, then after that, I go out to the showroom. That's always fun to go through. We have a small clearance area that I go through, and maybe I'll mark some stuff down. I walk the showroom; I always like to see what's new coming in. A lot of the times I'll have some buyers with me, and we'll go through all the new products and make sure I'm up to speed on what's came in and what's selling. By then, it's probably the afternoon, so I'll catch up on my reading or go on a tour of the backroom. A big part of that today is social media. JAKE JABS: It used to be newspapers, the television, and now it's social media. It's amazing, and in the last two years, it's been such a change in how you merchandise and advertise your business. It's really gone from the traditional ways -- the traditional way being newspaper, radio, and television -- to social media. One of the reasons our business keeps growing -- we were up 25 million dollars last year -- is because we have adapted. OCN: You're an accomplished musician, and you toured with Marty Robbins. What's your favorite music you listen to nowadays? JAKE JABS: Kris Kristofferson wrote some great songs, and I play a lot of his songs. He's really my favorite artist who wrote songs; he wasn't that good of a singer. He wrote great songs, really meaningful songs. Of course, my favorite musician was Marty Robbins. He wrote every song that he recorded except for "Singing the Blues." He was a great musician -- he played guitar, steel guitar, and piano. I enjoy musicians and singers that are entertainers, too. A lot of the times the one-hit-wonders were good singers, but they weren't musicians, so it was a short-lived career. The ones that really made a life-long career out of it were great musicians who could write songs or sing songs, too, because it became a life-long project for them. OCN: You've been in the furniture business for a long time. What advice would you give for someone just getting out of high school or college now? JAKE JABS: Don't get in the furniture business -- at least not in Colorado! OCN: *Laughs* One of the things you say that defines a true entrepreneur is giving back, and that's something that I know you have been very big on with all your charity work. What do you think "giving back" means? JAKE JABS: I think where that came from is growing up on a reservation in Lodge Grass, Montana, you would see a lot of poverty. You would see people dying at young ages from all kinds of things. I had a neighbor that died of epilepsy, for example, and there's really no epilepsy deaths anymore because there's ways to treat it. So I think growing up poor and seeing a lot of poor things, I always wanted to help, particularly with people who were born with a disability and are having a tough time in life. I come from a large family of nine kids, and we had every disease you could think of. We had the mumps, measles, chicken pox -- you name it, we had it. We lived far away from the hospitals, so there weren't really any doctors. I think, growing up poor and seeing all of these things, I always wanted to help people that had problems. OCN: You have a lot of awards. I walked through the office on the way in here, and there's just walls and walls of awards. What are a couple of awards you're most proud of? JAKE JABS: I think the thing that I'm most proud of is this Jake Jabs College of Business and Entrepreneurship at Montana State University. They call it the "Jabs Building" (Jabs Hall), and I designed the building. It's invigorated the whole university, and the president of the university has made comments to support that. Montana State was never known for its college of business. [The University of Montana in] Missoula always had the college of business. So, I thought Montana State should have a college of business because they have a great engineering school, agriculture school, nursing school, and today everyone needs some business skills. I don't care what you do. You could be a janitor, but you still need to know how to buy supplies. So, I said I'm going to make Montana State a business college, and today it's a bigger business college than Missoula is. It's up 10-15 percent each year in enrollment. I designed the building; it's a very modern, contemporary building. I did that purposefully because I speak to a lot of colleges across the country, and I wanted it to look like a modern office building instead of a college. In fact, we won an award for one of the best new college buildings. It's a fun building to go to; you enjoy going to class. OCN: *Laughs* They actually show up for college? Really? OCN: What do you think your legacy to Colorado is going to be? JAKE JABS: Well, it's several things. I think one of the things is we do all of these tours. Just the other day we had a group of MBA students at CU come. Helping education as a whole, I believe a big problem we have in the Middle East is a literacy problem. I spent most of my military career in Morocco in a Muslim country, and I landed a top-secret clearance and got to deliver top-secret mail all over the continent of Africa. I got flying experience -- great experience for a 21-year-old second lieutenant in the Air Force. In college, I got a commission in the Air Force, and my first assignment was Point Arena. You had to have a top-secret clearance and they said, "We need someone to go to the European theatre with a top-secret clearance." So I raised my hand! I got to travel all of Africa, got to travel to 24 countries delivering top-secret mail. It was a great experience in the Middle East. I think that whole problem in the Middle East is a literacy problem, and I think getting those people educated would solve a lot of problems. Instead of constant wars, have constant peace. I think that's one of the great things is helping education. The other thing, like Easterseals Camp, where they help people in wheelchairs and people with severe disabilities. They have a building named after me up there. They have a hot water pool, and I send them money each month to keep it running. I raised $460,000 at a charity function recently. We give to over a thousand charities a year. It's unbelievable. OCN: Jake, you've got your doctorate, right? JAKE JABS: I've got two of them. I've got one from Montana State, and I'm getting one from CU. OCN: A double doctor then! Good for you! A special thanks to Jake Jabs and the team at American Furniture Warehouse for taking the time to speak with OCN!